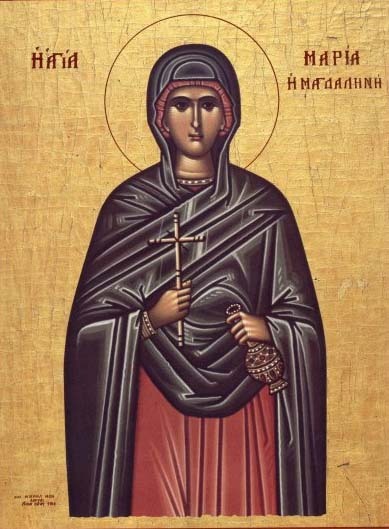 St. Mary Magdalene was mentioned by name as being present at both the Crucifixion and burial of Our Lord (St. Matthew 27:56, 61; St. Mark 15:40, 47; St. John 19:25). Furthermore, the Saint is best known for being among the very first witnesses of the Resurrected Jesus Christ. All four Evangelists make specific mention of St. Mary Magdalene going to the tomb on the morning of the first day of the week to anoint the body of Jesus for a proper burial. In each account, the Magdalene returns to tell the other Apostles, who disbelieve her account. 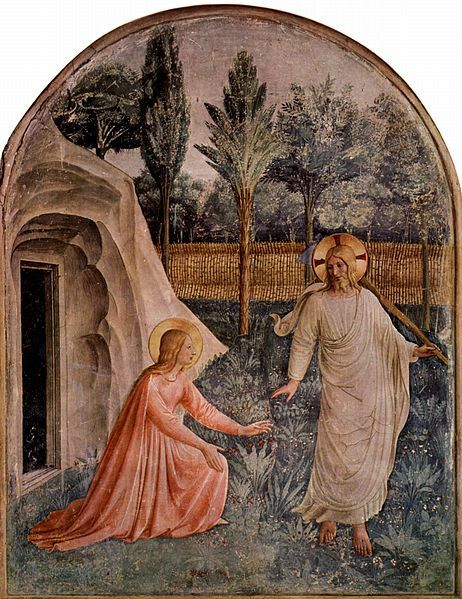 In St. John’s Gospel, having followed Saints Peter and John back to the tomb and remaining there once they have returned to their own homes, the Magdalene encounters the Risen Jesus and must be directed “do not cling to me”. (20:17) She returned to the Upper Room and, regrettably, once again the Apostles refused to believe her testimony. Now we turn to the confusing parts. In a sermon in 591, Pope Gregory the Great preached a sermon where he said that Mary of Bethany was the same woman that St. Luke mentions in chapter 7. The unnamed sinner of St. Luke 7 anointed the feet of Jesus with her own hair in the same fashion that Mary of Bethany does so in St. John 12:1-3. Drawing some conclusions that were later deemed to be unfounded, the Pope decided that these two women were actually one and, taking it one step further, the Pope also declare that St. Mary Magdalene and St. Mary of Bethany were the same person. Gregory the Great referred to her as a prostitute and extolled her as one of the greatest examples of a repentant heart and amended life in the entire Gospel. 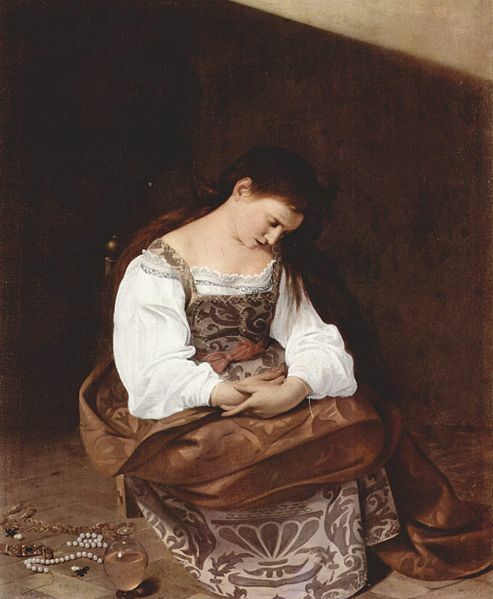 Thus, in the Western Church, St. Mary Magdalene became known as a repentant prostitute who turned her life around and became one of the most esteemed followers of Christ. The Eastern Church never came to the same conclusion. In fact, Eastern Orthodox tradition says that the Magdalene was so pious and devout throughout her entire life that Satan believed God might conceived the Messiah in that Mary and that Satan sent the seven demons to torment her just in case. Regardless of her occupation beforehand, she was, after all, the first person, man or woman, to actually see the Risen Jesus! There is a lesson for us even in our confusion about who the Magdalene was before she came to know Christ. The lesson it that it does not really matter! This may be an irritating prospect to the one who has lived “as a saint” for their whole life, but to the sinner who has come to know Jesus, it is hope and salvation. What if the Magdalene were a prostitute before her exorcism? Jesus saved her. He took her sins away and washed her whiter than the whitest linen. What if she had lived her life in the saintliest way imaginable? St. Paul tells us that “all have sinned and fallen short of the glory of God.” (Romans 3:23) In the same epistle, the Apostle also informs us that “There is none righteous, no not one.” (3:10) Even if everyone else around her believed that she were truly a saintly woman, she too had sin in her life; everyone does. So what then? Jesus saved her. He took her sins away and washed her whiter than the whitest linen. “Do you not know that as many of us as were baptized into Christ Jesus were baptized into His death? Therefore we were buried with Him through baptism into death, that just as Christ was raised from the dead by the glory of the Father, even so we also should walk in newness of life. Essentially, what St. Paul is saying is that when we are baptized, the sinner that we were is crucified with Christ. Those sins which we committed in life are atoned for on the Cross, yes, even the ones that had not yet been committed when he died! When we are baptized in to Jesus Christ, our sins are put to death and we rise alive in Christ Jesus. Thanks be to God! 7MARY MAGDALENE SAID,WHAT IS HIDDEN FROM YOU I WILL PROCLAIM TO YOU. Ok. So the above comment comes from an apocryphal work called The Gospel of Mary. It is not canonical. It is not Holy Scripture. It is, however, largely dismissed as heretical and most of the people who even bother to talk about it are of the opinion that Mary Magdalene and Jesus had children together and that was the Knights Templar were destroyed. Real Dan Brown kind of stuff. Pretty nutty if you ask me, Take it for whatever it is worth.